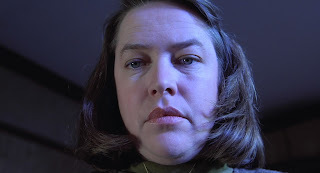 An exceptionally well made psychological suspense film, Misery is a nightmare of captivity, the return of the fanatic in the fan, and adulation meeting derangement with nasty outcomes. 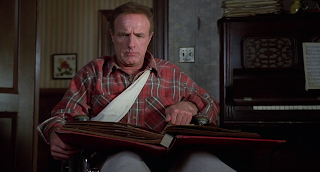 Best selling author Paul Sheldon (James Caan) finishes writing his latest book at a secluded cottage in Colorado. Driving back to civilization on a narrow mountain road, he is caught in a severe snow storm and crashes through a barrier and down an embankment. Severely injured with two broken legs and a dislocated shoulder, Sheldon is rescued by Annie Wilkes (Kathy Bates), a recluse living alone in a remote house near the crash site. Annie claims to be a nurse, and gradually helps Sheldon back to health, all while professing to be his biggest fan. Meanwhile, Buster (Richard Farnsworth), the local sheriff, starts to search for the missing author at the request of Sheldon's New York-based publisher Marcia (Lauren Bacall). Still bedridden but slowly regaining his strength, Sheldon begins to notice Annie's weird, erratic and sometimes dangerous mood swings. Soon he realizes that he is not a patient, but rather her captive: Annie will not let him leave. She reads his latest manuscript and hates it, then forces Sheldon to start writing a sequel to his most famous romantic series, insisting that he bring back to life the deceased heroine. As Annie becomes more physically violent, Sheldon discovers her horrific past and has to plot his escape despite being bound to a wheelchair. William Goldman adapted Stephen King's novel into a tightly wound screenplay. There is no relief in the compact running time of 107 minutes, as the tension simply mounts and nerves get openly frayed. Director Rob Reiner embarks on his first and only adventure into suspense and scores an immediate hit. Essentially a two character battle of wits predominantly set in a single house, Reiner livens up Misery with clever touches. He frequently fills the screen with Kathy Bates' passive aggressive face as seen from Sheldon's prostrate perspective, forcing the camera to share in Sheldon's suffocating horror. And when Paul finally gains some mobility on a wheelchair, Reiner has fun with awkward narrow doorways and locked doors, amplifying Sheldon's navigation clumsiness within Annie's house as he desperately tries to understand his foe and plan an escape. The two leads are marvellous to watch. Bates deservedly won a Best Actress Academy Award for her performance as the deeply disturbed Annie. With unnerving timing Bates effortlessly switches between caring nurse, manic oppressor and self-pitying victim, Annie clearly tormented by internal demons that prevent her from functioning within society's norms. Bates captures all that resides within Annie behind a tense mouth and eyes that pretend at affection while burning with a desire to control and destroy, seeking vengeance on some unspoken injustice that exists in her damaged mind. While Bates shines in a role of layered psychological complexity, James Caan has a less showy and more transitional portrayal: a man who is at first grateful that Annie saved his life first has to come to terms with inexplicably being a captive, and then has to simultaneously endure physical suffering from a mentally unstable captor, write a novel to keep her satisfied, and think of a means of escape. Caan uses his veteran skills to good effect, projecting a calm maturity in the face of adversity and a character who thinks through difficult situations and uses limited means to best effect. Misery of course loves company, and Annie longs to keep Paul as a permanent companion. Except that he refuses to submit to her miserable world, which makes for a grand conflict between two memorable adversaries.